It's impossible to distinguish any features of space shuttle Endeavour docked with the International Space Station as they fly over Monday night. After previous failed attempts to photograph space shuttle Endeavour and the International Space Station as they moved across the sky in unison, I finally witnessed the spectacle Monday night with about a dozen other people at Lake Washington in Melbourne. Yet, it was another failure in the photography department. Those earlier tries were thwarted by either cloud cover or a forgetful brain. And for the last possible viewing time for Endeavour-ISS on Monday (they undocked Tuesday), the resulting photo when I did see the attached spaceships streak overhead is not even recognizable. Either atmospheric distortion or a poor choice of camera settings produced a clumping of colorful swirls through my 500mm zoom lens. One cannot even make out the station's solar arrays, which are apparent in this earlier image. But what was notable Monday were the other people who were on hand for the celestial event. They piled out of three vehicles and gathered on the shore of the lake just a few moments before the 9:53 p.m. flyover, which lasted only a minute. Though one cannot tell from this image, the real-time viewing was brilliant. 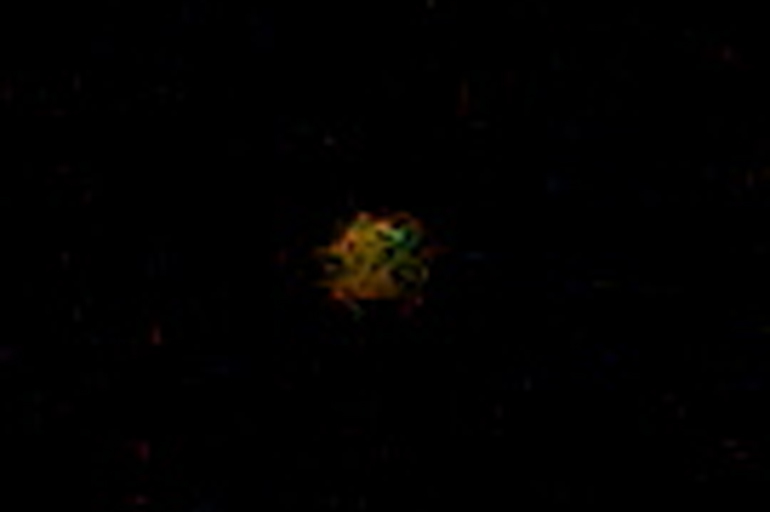 The station-shuttle complex was the second-brightest object in the night sky, as it progressed from the horizon in the northwest to a height of 54 degrees in the west, making it seem as though it were overhead. It had more of a reddish tinge than what I'm used to seeing. I had spotted the fast-moving ball of reflected sunlight before the other people. But after the first person in the group pointed it out, other members oohed and awed. For many, it was their first time. It's nice to see other people's enthusiasm for such things. With a recession still afflicting the United States, NASA has had its share of detractors when it comes to budgeting for space missions. But there's just something about seeing the space station - and, in this case, the shuttle - as it moves at 17,200 mph in orbit around Earth. It's difficult to explain. And even more difficult to illustrate in a photo.